I thought that perhaps it was just a sensationalised headline, you know how the media can be sometimes, but it wasn’t. Holy batman. What a stupid ban. Why on earth would you ban gay people from joining your organisation BSoA? Are you aware that being gay isn’t actually contagious? Worried that if you have a gay man as a scout leader he is going to encourage these young boys to all become gays so that he can spread his gayness and contaminate your entire organisation and make it one big gay event? It’s rather unbelivable that in this day and age, things like this are still happening. Although I am pleased to see that “some” board members support internal change and gay members members should be allowed to join. Boy Scouts chief executive Bob Mazzuca said. “We fully understand that no single policy will accommodate the many diverse views among our membership or society.” – wait, what?!? What about a policy that states we welcome any person to join the scouts regardless of their race, religion or sexuality? I’m pretty sure a policy that treats every person equally is something that can accomodate the many “diverse” views among your membership or society. Or wait, do you mean “homophobic” views. I can see how you could get those two things confused. 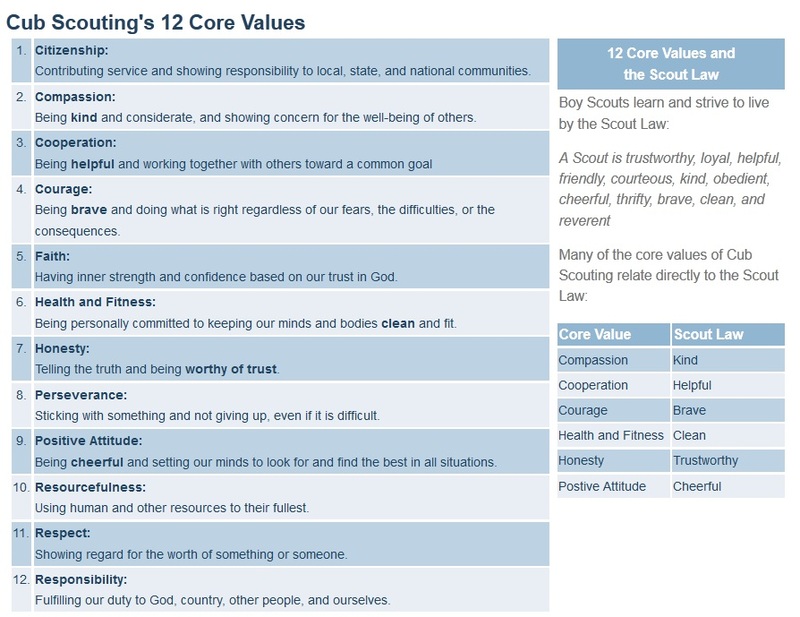 I found the Boy Scouts of Americas 12 core values (see photo below). Not quite sure how these values that Scouts should live by go hand in hand with the organisations decision to ban gay people from joining. Take value #2 for example “Compassion: being kind and considerate and showing concern for the well-being of others” – how is banning gay people from joining teaching your scouts “compassion”. You’re basically saying “hey, you’re gay, we don’t want you or your gay family to interact with us in our non-gay ways”, I can’t totally see how that is being “kind” and “considerate” and “showing concern for the well-being of others”. Then there is number #11, Respect: showing regard for the worth of something or someone. Personally I think it is pretty disrespectful to discriminate against someone because of their sexuality. 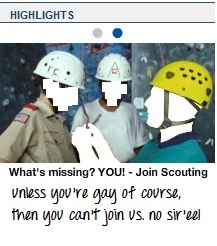 I sincerely hope that the Boy Scouts of America rethink their decision to ban gays from joining. In a world where we are fighting for the right for gays to have the same rights as straight people and be allowed to marry, to be treated equally, this decision is disgusting. I’m glad I don’t live in the US, because if I did, then my kids wouldn’t be allowed to join the Boy Scouts of America and I wouldn’t donate to them either. Shame on you Boy Scouts of America. Shame. On. You.